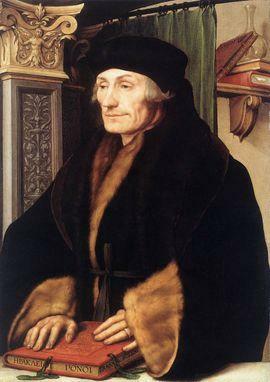 The Dutch monk Desiderius Erasmus of Rotterdam (1466-1536) is considered one of the greatest philosophers in Europe. He was a renowned scholar and was entrusted with the education of Charles V, the future German Emperor, King of Spain and Sicily, and Lord of the Low Countries. There are numerous respectable institutions named after him, like the University in Rotterdam, and he is hailed for his supposed ‘cosmopolitism’ and ‘tolerance’ in an age of religious conflict. Looking closer at his writings, there appears another Erasmus, which is neither multicultural nor tolerant. Was Erasmus really an ardent defender of religious freedom and civil rights for all? In the beginning of the 16th century the dissident theologian Johannes Reuchlin was the light bearer advocating equal civil rights for Jews. Erasmus was not in favour of this: “I am no Reuchlinist… never have supported him, he would not even have wanted that” (Jonathan I. Israel, The Dutch Republiek 1477 – 1806, p.50). Is that true? Erasmus traveled throughout most of Western Europe during his lifetime (Italy, France, England, Germany and the Low Countries). However, he did not visit Spain because “it was crawling with Jews” — to put it in its own words, and he declined many invitations for this reason. On the other hand, he hailed France, because “it was not infected by Jews and marranos [i.e., crypto-Jews who pretended to be Christian].” Erasmus in other words disliked Judaism and even the presence of Jews was to be avoided. In 1529 Sultan Suleyman, also called the Great Turk, captured Budapest and was bound to conquer Europe. The fear for the Turks engulfed Europe and it also grasped Erasmus, who wrote a book called Considerations for a War against the Turks. In this book he describes the Turks as “a bunch of barbarians from a dark source whom God has sent us like He once send the frogs to scourge Egypt.” Erasmus saw the Turks as an ordeal for European Christianity. He thought that Christians should renew their faith to make them prepared for the Turkish onslaught. In a way he was a visionary, because the decisive victory over the Turks at Lepanto in 1571 was attributed to the praying of the rosary all over Europe. Erasmus was a celebrated scholar during his lifetime and he travelled most of Western Europe to spread his ideas. In his time he was a man of the world, but he was no multiculturalist or cosmopolitan. He saw Christianity as the core of European civilization and Judaism and Islam as a threat to the dominance of European Christianity. He was a peaceful man, but advocated war against the Turks. He was a man of wisdom, but rejected Jewish teaching. Although he was in favour of the Greco-Roman Renaissance (the appreciation of sources of antiquity), he fervently opposed the Hebrew Renaissance in order to thwart resurgence of Judaism. He saw Judaism and Islam as alien and incompatible with European Christianity. The difference between Judaism and Islam is that Muslim Turks were foreign invaders, while the Jews were the enemy from within, opposing and criticising Christianity.